Of all the enemies Warmaster Honsou has made in his artificially prolonged lifetime, one stands above all others – Uriel Ventris. Honsou’s hatred for the Ultramarine captain burns so brightly that he will stop at nothing to extract his revenge, even attempting the nigh on impossible task of capturing the most heavily defended of the Ultramarines star forts, one that holds a secret at its very core. Iron Warrior is the first of Black Library’s range of exclusive A5 hardback novellas and features a lavishly illustrated exclusive Honsou novella from the pen of best-selling author Graham McNeill. Packaged in a wraparound cardboard dustjacket this rich hardback is filled with many pieces of artwork, both illustrations and full colour portraits, produced specifically for this novella as well as a marker ribbon. Each copy is signed by the author, and Iron Warrior is strictly limited to 1,000 hand numbered units. The more we talked about the project, the more it became apparent that we could do something a bit special with it. Artwork, inserted diagrams, maps and so on. We talked all manner of funky things we could do, and from that was born the new line of premium, limited edition books. And if you’re one of the lucky few who managed to get hold of a copy, treasure it, love it and keep it safe. Now that we had the concept of the book in place, I needed to actually write the thing. I knew that even with all the warriors Honsou had amassed during the Skull Harvest, he didn’t have nearly enough to take on Ultramar. That formed the core theme of the story, as I’d already seeded what was going to happen in TCD at the beginning of Courage and Honour when Uriel and Pasanius return to the gates of their fortress monastery. They were going to release the daemon prince, but how that was going to happen led me back to first principles, looking at where we’d been with the Iron Warriors in their short stories, and where they were going to go in TCD. Iron Warriors are siege masters, but I didn’t want to rehash Storm of Iron, so looked at ways I could play to their archetype without doing something I’d done before. Originally, it was going to be a siege of a giant, aircraft carrier thingy. A mobile siege! But that fell by the wayside when it just didn’t make logical sense with what Marneus Calgar had chained in its heart. But a star fort…? A siege in space! 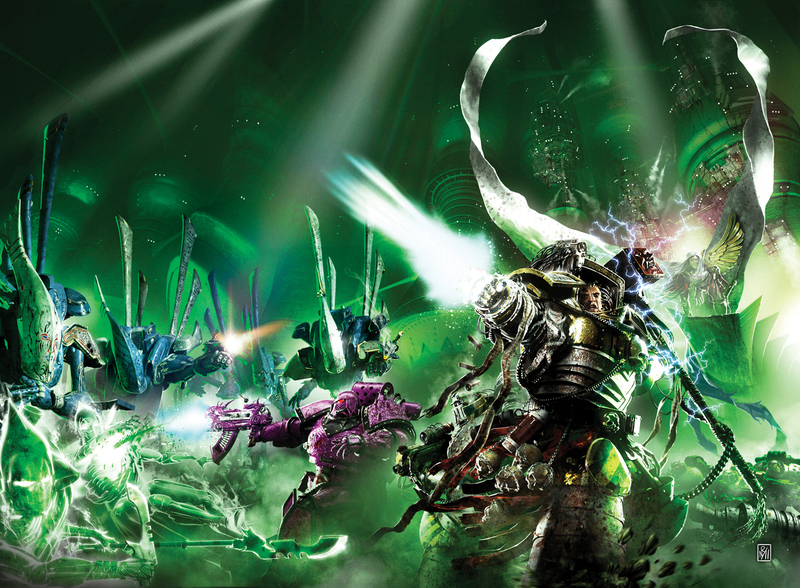 Space Marines doing what they do in actual space! That was a winner. I wrote this story pretty quickly, though it was tricky making sure everyone got face time over the reduced length, while still moving the story along at a brisk enough pace. Everyone got to do cool stuff, and to throw in the curveball of the Eversor was something I’d wanted to do from the very beginning. Add in a level of Calgar’s fallibility, a released daemon prince and its army of daemons, and suddenly you had a whole new level of threat aimed at Ultramar’s heart. The story had to be pretty enclosed, in that if you didn’t get a copy, you could still go into TCD without being confusticated by what was going on. I needed to be able to summarise events of Iron Warrior in a sentence and not break the flow with a recitation of Basil Exposition. The artwork Neil Roberts did for the characters was spot on, and really helped when I was writing TCD, as it made it so much easier to visualise them. We’d worked back and forth with ideas and concepts along the way, and even if you’d plucked the images of how I’d visualised the characters straight from my brain, they wouldn’t have looked any different. Adi, Darius, and Rosie did a great job with the internal artwork, and with us all working together on it, gathering round the table to chat and sort out what was happening with it, the book became that much stronger. As much as I think this is a great book to read and look at, there were downsides; the main one being that not everyone is going to get to read it. A thousand units only, but then it’s not a limited edition if everyone can get hold of it. It becomes much more prized as an artefact, but as a writer you want as many people to read your work as possible. Maybe later we’ll see if we can’t release the story in some format (but without artwork, as those who forked out for the special edition need to have some reason to be pleased they got it!). The other downside was that every edition was individually signed. Not a downside for you guys, but I spent a whole day from 8.30am to 5.45 signing over and over again. All day. Still, it was worth it in the end, so it’s not really a downside, especially as I own edition 001.